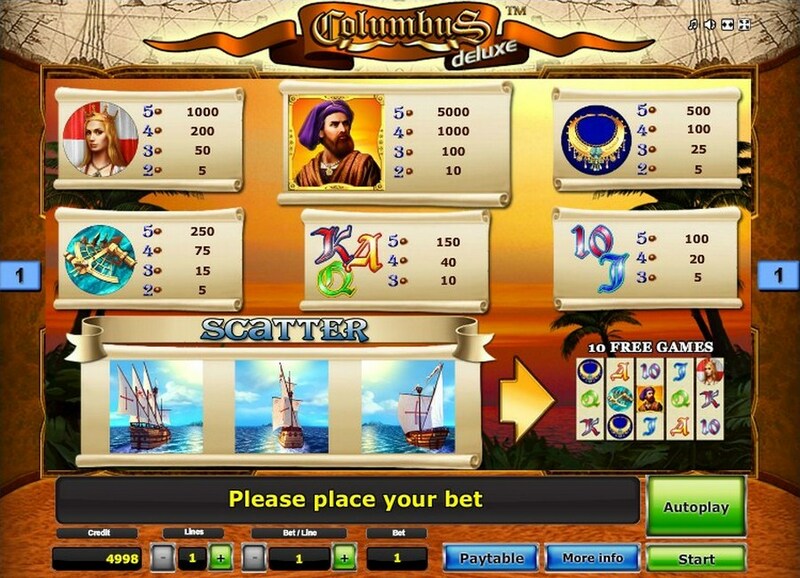 Columbus Deluxe is an exciting slot machine game from the casino software developers at Novomatic and has a Nautical theme and as one may expect all things Columbus related. The wild is represented by Columbus and he can replace all symbols with the exception of the Hispaniola ship. Columbus Deluxe is representing like a video game with 5 reels, 3 rows, and 10 paying lines that can be set as you prefer. 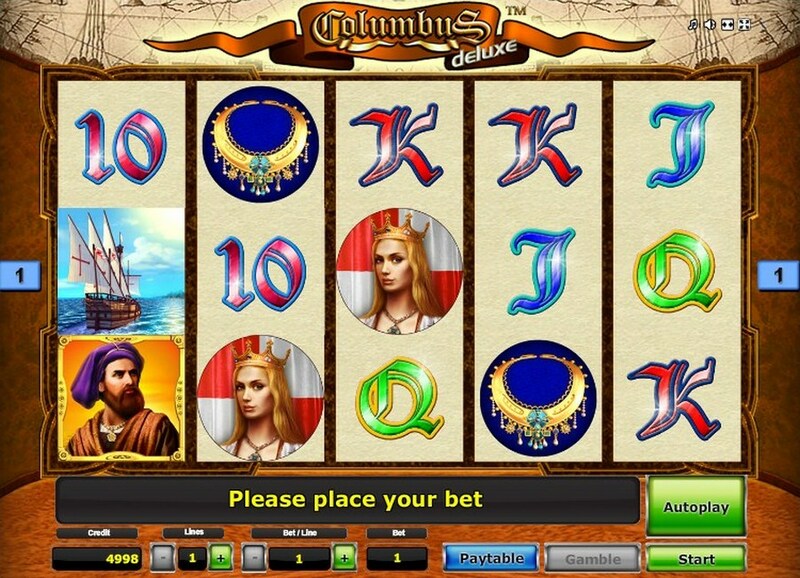 Prominent Columbus Deluxe free slot has a jackpot of incredible $100,000, which is only available when selecting all pay-lines and staking the highest stake. 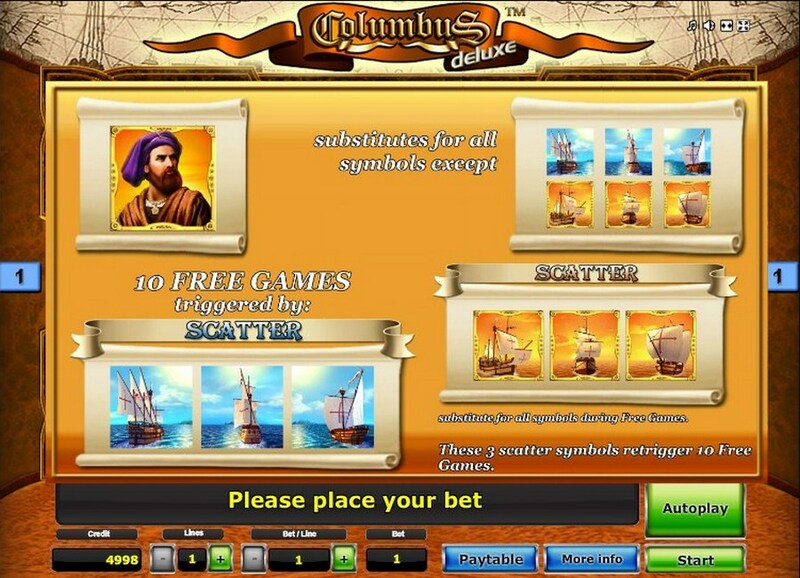 The online version of Columbus Deluxe slot game has 10 cards in total, 5 of which are regular, 3 high win icons, the Wild, and the Scatter. In order to check how much each card gives, you should click the Paytable button at the bottom of your screen. Also, by entering the Paytable screen, a new button appears, called More Info, which allows you to read the rules of the game. Regular Icons– these icons are, as in most games of this nature, depicted by the alphabet (K, A, Q and J) and the number 10. It takes 3, 4 or 5 of the same symbol of slot to win from 5 to 150 coins. High Paying Win Icons – they award much more than regular slots symbols, and you need to collect only two of them to get the minimum award. These are represented with the Sextant (a navigation device; its prize goes from 5 to 250 credits), a Necklace (awards from 5 to 500) and the Queen which brings the highest amount of the High Wins. You will be awarded an amazing sum of 1000 coins if you have the luck of getting 5 Queens on the reels! The Wild – is represented by the protagonist himself, Columbus, and its function is to substitute for all other symbols except for the Scatter icon. By getting 2 to 5 main-character cards, you are awarded a coin prize as well. This prize has a range from 10 to 5000 credits! The Scatter – in this game is depicted by a ship. The Scatter can appear only on reels 1, 3, and 5, and the ship is shown from three different angles, depending on which reel in appears. When you collect all three of them, you are awarded 10 free spins. During the free spins feature, the Scatter serves as another Wild. Free Games Feature. When you have three Scatters on the reels, you automatically trigger the 10 Free Games Feature. Once the addition starts, the ship icon is to become another Wild symbol. To re-trigger this option, you need to collect another three Spanish ships. Gamble Option. The Gamble button will appear whenever you earn some winnings. If you feel like risking it in order to double everything you have won in the previous round, all you need to do is click the button, and you will be instantly seeing a new screen with an unrevealed card. Your task is to correctly guess the color of the card to double the win. If your guess is incorrect, you lose everything you have gambled.